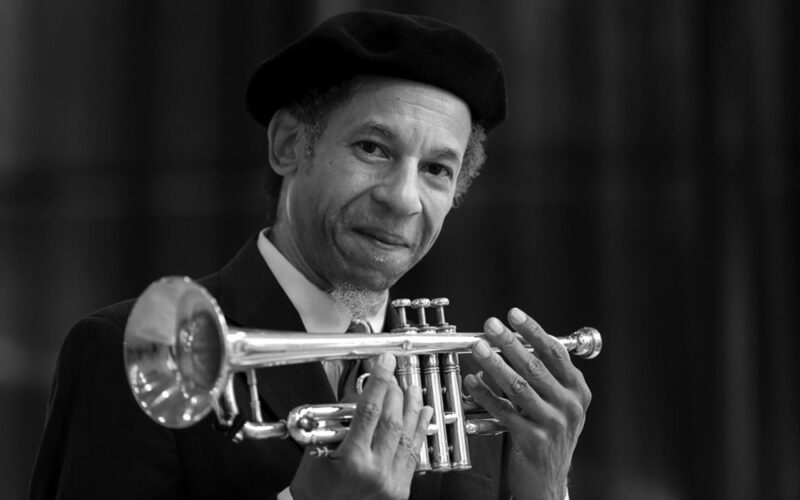 Trumpeter Nathan Breedlove, like all musicians, has collected stories his entire life. His story. Jazz stories. Stories about famous musicians Art Blakey, Lionel Hampton, and Wynton Marsalis. Stories about masterful but modest artists like Mulgrew Miller, James Williams, and Hadley Caliman. Stories about the feast and famine of a life in music. Breedlove’s passion played on his slender face. His glow of enthusiasm emanated from a bounty of arched creases on his forehead and the depth of parentheses surrounding his lips. He smiled and relayed his past. During high school at Hillcrest in Memphis, Breedlove performed in the Norsemen jazz band. Under the direction of Jim Terry, the band won the 1974 All American Stage Band Festival in Mobile, Alabama. There is a black-and-white photo on Flickr of Breedlove playing a flugelhorn solo with the band. Always with a sense of style, he donned a light fedora, unbuttoned shirt with rolled-up sleeves, wide white belt, slim bell-bottoms, and square-toed shoes. A scholarship paved his way to Memphis State, where he befriended pianists James Williams, Mulgrew Miller, and Donald Brown. All three would eventually perform in New York City with drummer Art Blakey in the Jazz Messengers. Breedlove dreamed of someday becoming a Jazz Messenger himself. After a year of college, Breedlove found himself back where he was born for an 18-month stint in an Air Force band stationed at McChord Field. From there, he joined Onyx, a funk band in Seattle. When tenor saxophonist Hadley Caliman moved north from California, Breedlove began rehearsing with him every Tuesday at bassist Phil Sparks’ house. Over the years, Caliman and Breedlove made three recordings together, but none have ever been commercially released. Breedlove began taking exploratory trips to New York City. He borrowed $1,000 from Marc Smason and offered two trumpets as collateral. He moved to the Big Apple in 1989 and quickly fell in with jazz royalty by hanging out and sitting in at Bradley’s, a beloved but small bar on University Place in Greenwich Village. Many great artists performed on the house piano that once belonged to saxophonist Paul Desmond. From a warm reception at Bradley’s, Breedlove scored gigs with Lionel Hampton, Evelyn Blakey (Art’s oldest daughter), and a reunion of the 1960s Jamaican ska band, Skatalites. During his nine years with the Skatalites, the band earned two Grammy nominations. Breedlove also dove into avant-garde jazz, touring Europe with drummer Denis Charles and saxophonist Jemeel Moondoc. The band recorded Captain of the Deep in 1991, at the De Effenaar Culture Center in Eindhoven, Holland, during the Zuid Nederlands Jazz Festival. Ironically, the day it was released in 1998 on Eremite Records, Charles died. That year, the CD earned Jazziz critics top ten recordings and Cadence reviewers’ choice best recording. Following these accolades, Breedlove spent more time in Europe with saxophonists David Murray and Ricky Ford. Much later, Breedlove lived with Evelyn Blakey. When Art was very ill with terminal lung cancer and visited his daughter’s apartment, Breedlove soothed his pain by playing piano. Breedlove returned to the Seattle area in 2005 to care for his own ailing mother-in-law and temporarily retreated from active public music-making. Lucky for us, he has broken his hermit-like silence with an interview in bassist William Parker’s 2015 book Conversations II, an appearance with Jameel Moondoc and Matthew Shipp at Vision Festival in New York City, and a new recording on Space Note Records of his project, The nu Trio. Joined by bassist Phil Sparks and drummer Brian Kirk, Breedlove’s March 2016 release Captain of the Light Brigade charges forth with “Calvary,” a minor blues by saxophonist Billy Harper. The playlist also includes Vernon Duke’s 1934 ballad “Autumn in New York” as a nod to his time on the East Coast. Breedlove pays tribute to past trumpet masters with Kenny Dorham’s ballad “La Mesha,” Fats Navarro’s bebop melody “Fat’s Flats” on the chord changes of “What is This Thing Called Love?” and Lee Morgan’s shuffle “Triple Track.” Breedlove’s original “The Hermit of Nu” ends the program by adding guitarist Lonnie Mardis. Breedlove has refined a distinctive trumpet sound all his own. With the punch of Morgan, the warmth of Navarro, and thoughtfulness of Dorham, his tone exudes kindness. Full, fertile, and funky, his long notes shimmer with vibrato and short notes articulate with percussive intensity. His phrasing comes like a fastball straight out of the bebop tradition.